Once I realized that it was not just a word made-up by people who blog about money for a living, I decided I should probably try to be more frugal to get ahead financially. After all, there were all these cases of people talking about their budget, their net worth, and their debt free date on the internet. Frugality seemed to be working for them. But it was a lot harder to make the mindset switch from spending money freely to having a frugal plan than I thought it would be. Once again, my shopaholic ways were not working in my favor when it came to embracing this new (to me) concept of frugality. If that sounds like you, don’t worry. 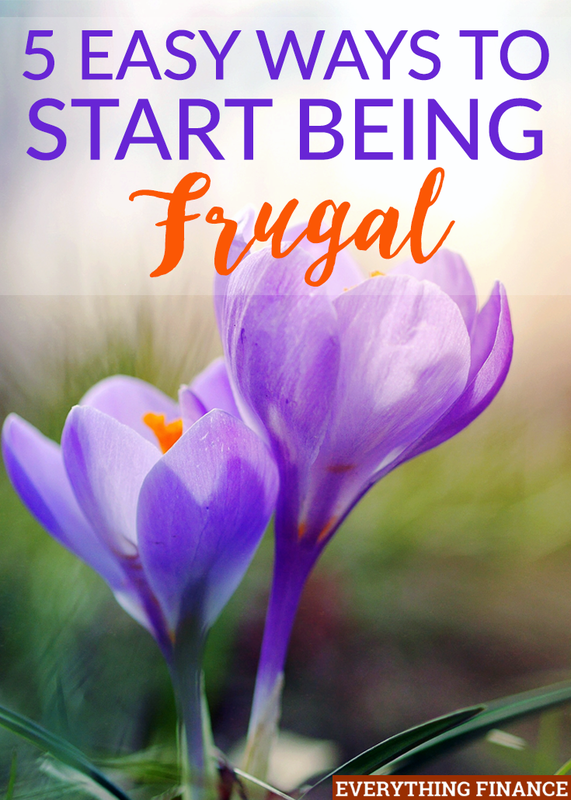 There are easy ways to start being more frugal even if you hate the concept or think it’s a made-up word like I used to think. Don’t believe me? Here are 5 easy ways you can start being more frugal with little extra effort. The first thing you can do to start being more frugal is to stop paying full price for things whenever you go shopping. I couldn’t hit you off the bat with “stop shopping” because remember, I said these were easy ways to start being more frugal. 🙂 Kicking your shopping habit to the curb is a good idea, but it’s not exactly easy. In the meantime, you can resolve to quit paying full price when you go shopping. This means looking for deals on the sales racks at clothing stores, shopping second-hand for some items, and shopping with an eye on the sales flyer at the grocery store. Now, I know it’s not always possible to find the exact items you need on sale or used, but putting in an effort to look there first is a good step in the right direction toward being more frugal. Whenever I’m looking for something specific for my wardrobe for an upcoming event, I start looking early. This gives me time to shop around for used options at thrift stores and online thrift stores like ThredUp. If I don’t find what I’m looking for there, then I will start looking at sales racks at stores in the mall. Then as a final resort, I might pay full-price if I’ve exhausted my other options first. This may sound like a lengthy process to save a few bucks, but it doesn’t really take that long and the savings can be huge. I can’t believe how much money I used to spend on entertainment. I remember once Christmas break when I was in college and I couldn’t afford to buy groceries, so I was eating random things from my cabinets. Yet, I still rented 2-3 movies a week from a movie rental store (this was before Redbox). I’m not sure how much I spent on movie rentals to entertain myself while my friends were all home for Christmas vacation, but it was definitely enough that I could have paid for groceries instead. I also worked at the mall and would end up “window shopping” and usually buying something that I didn’t need during my break at work, too. Yikes! Nowadays, I try to find free ways to entertain myself. I like to read books I already own, check them out from the library for free, or even borrow them from friends and family members. I also enjoy having potlucks and game nights with my friends on a regular basis. Once in a while, I will rent a movie from Redbox for $1.50 a day, but most of my movie watching is done via my Netflix subscription for $8 a month. Being frugal doesn’t mean you can’t have a social life, you just have to re-frame the activities you used to do and find cheaper alternatives instead. While I’m on the topic, one of the easiest things I’ve done to start being frugal is canceling my TV subscription. As I said, I already had a Netflix membership for $8, so when I decided to cancel my TV subscription, I didn’t really feel the pain of losing access to my favorite TV shows. Admittedly, I did sign up for Hulu for another $8 a month, bringing my bill up to $16 a month total for both Netflix and Hulu, but that was still a far cry from the $65 I was spending on cable. Plus, this wasn’t a huge sacrifice to my lifestyle since I can still watch most of my favorite shows with Netflix and Hulu, and I don’t watch that much TV anyway. I’m always shocked at the people who say they don’t know how to cook even the most basic of meals. I know several friends who rely on eating out and pre-packaged foods for every one of their meals because they don’t know how to cook. I can’t imagine the impact this has on their budget and their health because these types of eating habits are not good for either one. Luckily, learning how to cook isn’t that difficult. You can start with some pretty basic recipes with only three or four ingredients and end up with a good meal for far less than it would cost to eat out. The biggest part about cooking is taking the time to pay attention to what you are doing, and I think this is the part that most people struggle with. Finally, there are lots of little habits that you can easily change to be more frugal without much of an effort or impact on your lifestyle. For example, you can start washing your laundry on cold instead of hot. It’s not hard to change the dial on your washing machine one time, and it will stay there until you switch it back. You can also change your thermostat up or down a degree or two without feeling much of a difference in the air. This will add up to some pretty significant savings during the dead of winter and the heat of summer. There are lots of little habits and things you can change to start being frugal and save money without feeling a big impact on your lifestyle. “Frugal” isn’t an evil word, you just have to find ways to embrace it while still being true to yourself. Can you think of any other ways to start being frugal without making huge sacrifices? What are your favorite ways to be frugal?